WE DO NOT MAKE THIS SCREEN OVER 40" IN DIAMETER. NEW PRICING FOR ONE PIECE SCREENS! We sharpen our pencils and streamlined production to make these one piece screens as least expensive as possible. We wanted to compeat with China but with a much better product. Shipping is in additional to screen price to keep your cost down and so you can see where your money is going. Free shipping isn't free. Someone is paying it. Please be advised we have changed the design of our one piece screen handles. You now have a choice between a one peice screen with two handles ( At an upgrade of $25) as pictured below or a simpler more discreet handle like the picture on the left (included in the screen price, no additional cost). TO SEE A BETTER EXPLANTION OF PRICING, SHIPPING COST AND ORDERING SEE CHART BELOW. Our Custom made one piece fire pit safety screens are available in round, square or rectangle configuration. When ordering the square and rectangle measurements are the same as the diameter of a circle. A 24" square is the same as a 24" round. Rectangle use the largest side as the same as the diameter of the round. Our one piece fire pit screens are available with two frame options. We use the same high quality stainless steel mesh on both options. The difference is the material used in the frame. Our first choice is what we call our Regular model. 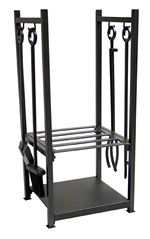 This frame is made using a mild steel for the frame material. The second choice is the Deluxe model. This upgrade is made using a 100% Stainless Steel frame. This option means everything on that screen is SS. SO WHAT'S THE REAL DIFFERENCE BETWEEN OUR DELUXE SCREEN vs. 100% STAINLESS STEEL. We use the same wire cloth on both options. Will the 100% SS screen last longer then the deluxe? Probably the same life expectancy. The issue is rust but not like you think. The mild steel frame (The Regular model) will need to be touched up with some high heat paint sooner or later. Period. And we sell some of the best high heat paint on the market. But that's still not the issue. The BIG reason is rain. When it rains the water will flow down the screen and through the frame. I don't care how well the screen is painted but when the water goes through a weld joint the water could get dyed a red rusty tint. This dyed water could make a dyed water mark ring on your masonry work on top of your fire pit. This goes for any fire pit screen on the market that's not made of 100% stainless steel. Have you read that anywhere else on the internet? Probably not! Because we have been doing this for a long time. Both of our frame options use the same manufacturing technique. We do not weld our mesh material to the frame as other competitors do. We sandwich our mesh material between two pieces of flat steel. The outer frame and an inner layer frame. We do this because stainless steel expands quite a bit when it gets hot from the fire and if the mesh is welded it could tear at the welds or least it would cause undo stress on the material and shorten the life of the screen. By sandwiching the mesh it has room to move and it's a lot stronger maximizing the life expectancy of your screen. The mesh material is hand formed into the dome with no upright supports. Again this is done so the material can expand and contract without stress. When we form the dome we try to achieve the highest profile the material allows. The mesh is heavy duty and we can only achieve such a tall profile without creasing the mesh and the height is in proportion to the diameter. Using the techiques of sandwiched mesh and the free form dome this will add many years to the life to your screen. If you have any questions please call Jim 817.946.6463. If you see a dimple in the material this is normal. With a little push it reverts back to it's opriginal dome shape. Remember these are hand made and formed. Now you know how we make our screens let's discuss your needs! What size fire pit screen do you need? What configuration do you need? Round, Square or rectangle. What type of a fire pit are you putting the screen on? 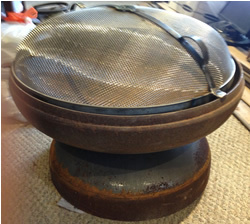 Does it rest on the outside flat area of your fire pit or does it fit inside on a ledge? There are so many different applications and different configuration out there the options are limitless. First, If our one piece screen is replacing a screen you all ready have then simply measure the outside diameter of your old screen and order that size. Second, If you are putting this on a built in fire pit and it has some kind of flat masonry around the fire pit then measure the inside of your fire pit and add 4" and order accordingly. Those are the simple ones to configure. Now lets say you bought a fire bowl for someone like John Unger ( Goggle him, he does awesome work) and you need a screen. 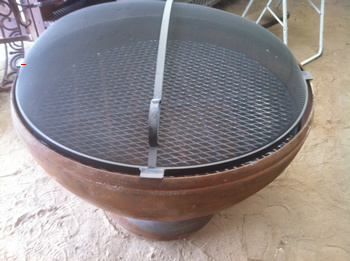 Or you have a gas fire pit table and you don't want the screen to sit on anything but sit inside of the bowl. No problem. What we do is we weld what we call "Tabs". These tabs are usually 1" or 2" square pieces of steel that we weld on the outside or inside of the fire pit screen depending if you want the screen sitting inside the fire pit or resting on the outside of the pit. With the fire pits below either inside or outside looks good. If it were mounted an the outside you wouldn't see that band around the top of the fire pit and it would like they were made for each other. But if you look at the picture on the bottom on the right side of the screen around the back you see another tab. On these screens we installed three tabs equally apart with one tab right below the handle. What happens here is the screen is lifted by the handle but pivots upward on the back two tabs. Enabling the user to add or stoke the firewood with out actually lifting off the screen. This style of screen can be adapted to many different fire pit configurations. Such as a gas fire pit table. We do a lot of these. It sits inside and rest on these tabs. If this is something you might like but your not actually getting the VISION then call Jim 817.946.6463. If you have any questions call Jim (me). Lol. 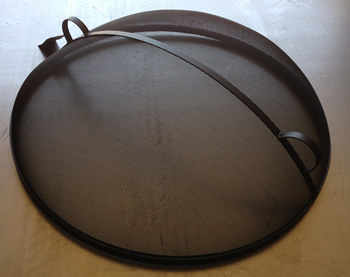 We can only make a one piece screen to a max of 40" diameter. Any screens that are larger then 40" look at our deluxe four piece screens with doors. Most all screens the shipping is relatively cheap and rarely go over $50 except for the larger screens. If your screen is over 32" or call for shipping prices. Please Note We Do Not Warranty the Paint. We suggest that when you order then screen ask for an extra can of special heat resistant paint $10 extra. This is a steel product that your putting into a fire. It will, not if, need touching up sooner or later. It may also get a few scratches during shipping. No Returns on Custom Made Screens and These are all custom made to order.